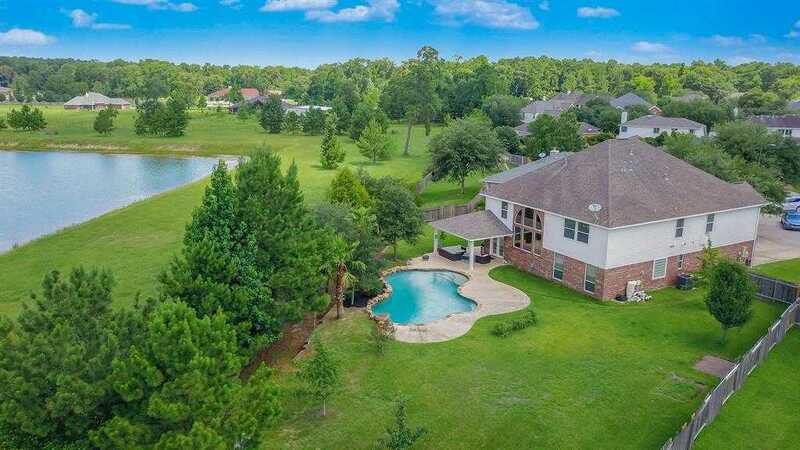 TRULY ONE OF A KIND…6 bedrooms, 3.5 bath with a pool on a huge, private, cul-de-sac lot with no backyard neighbors and an amazing lake view in the popular master planned community of Imperial Oaks. This home features a NEW ROOF, stunning 2 story entry & family room with lots of windows offering private views of the pool and lake, both formals, hardwood floors & gas log fireplace in family room, kitchen with granite counters & under cabinet lighting, downstairs master bedroom & large master bath with double sink and a huge walk-in closet. The 17,720 sq.ft. lot is complete with pool, water feature & covered patio. Upstairs feature a huge gameroom, 4 large bedrooms & 2 full baths (one is Jack & Jill). New roof just installed. Conveniently located to I-45, Grand Parkway and the Hardy Toll Road. Not to mention all the nearby shopping & dining. Zoned to highly acclaimed Conroe ISD. No flooding during Harvey OR EVER! Please, send me more information on this property: MLS# 45002572 – $357,000 – 22921 Antiqua Estates Court, Conroe, TX 77385. I would like to schedule a private showing for this property: MLS# 45002572 – $357,000 – 22921 Antiqua Estates Court, Conroe, TX 77385.